The NK8-PC is an application that allows control of your entire home’s lighting, thermostats, security system, webcams and electricity meter from a PC running Windows XP, Windows Vista, or Windows 7. The NK8-PC works through the popular ISY series of home automation controllers. - Customizable. Our interface allows you to create your own hierarchy of folders & controls. You create the layout and choose which buttons you want where. Create a custom layout to match your PC’s location, or your personal preference! - Easy. Our drag-and-drop configuration utility automatically downloads devices & scenes saved in your ISY, and let’s you build your own custom interface in minutes! 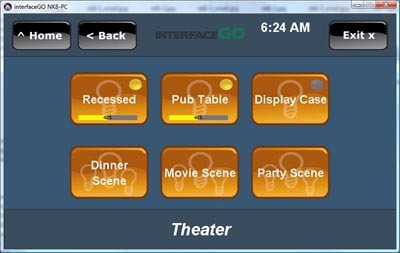 You will need a Universal Devices ISY-series home automation controller, running firmware 2.7.6, attached to your network. You will also need a PC running Windows XP, Windows Vista, or Windows 7, with the latest version of Java installed (currently 1.6). What are the requirements for the configuration utility? The configuration utility requires a PC running Windows XP, Windows Vista, or Windows 7, with the latest version of Java installed (currently 1.6). Minimum screen resolution is 1024×768. How configurable is the interfaceGO NK8-PC’s interface? Very. We’ve designed the GUI to allow full control over the folder/button hierarchy to suit the end-user’s preference. Is the interfaceGO NK8-PC limited to 8 buttons per folder? No, though it is limited to 8 user-definable buttons per page. 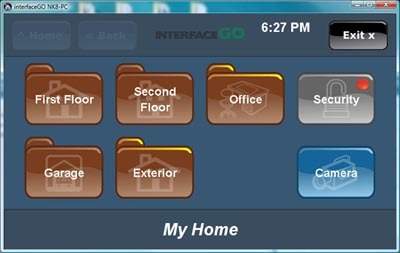 The customizable interface does allow multiple pages of buttons within a folder. Does the NK8-PC display the status of my home in real-time? Yes. The interfaceGO NK8-PC communicates with the ISY in real-time – no manual screen refreshing is needed. If the ISY knows that a light, thermostat, or security system status has changed, the NK8-PC knows and will update it’s GUI immediately. Can I control my home with the NK8-PC application through the internet? Yes, the NK8-PC can be configured to control your home from any internet connection – as long as your router and ISY are configured to allow external access. The NK8-PC supports both HTTP and HTTPS. Since the NK8 is in constant communication with the ISY, a reliable internet connection is required. Please keep in mind that an HTTP connection is not encrypted, so use this connection method at your own risk. Can’t I already control my ISY automation controller through the PC? 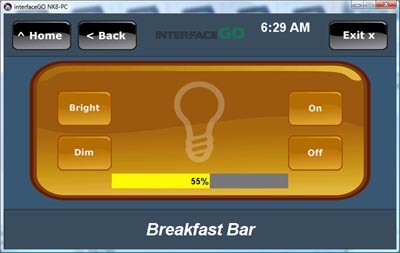 Yes – but the NK8-PC software provides a more simplified and organized way to control your lighting & thermostats. Friendly for the whole family! How many PCs can I install the NK8-PC software on? The NK8-PC software is licensed to be installed on a single PC. Additional PCs require additional licenses. The Config Utility can be installed on as many PCs as you’d like. When will the interfaceGO NK8-PC application be available? The NK8-PC is now shipping. How much does the interfaceGO NK8-PC cost?